When the U.S. military first invited China to participate in the biennial Rim of the Pacific naval exercise, it hoped China might stop its militarization of the South China Sea and realize that engaging in great power competition was futile. Now, four years later and with neither goal accomplished, a naval expert involved in inviting China to RIMPAC in the first place says he’s not surprised the country was disinvited this week from participating in this summer’s event. Bryan Clark, who worked as a special assistant to then-Chief of Naval Operations Adm. Jonathan Greenert when China was invited to join the 2014 RIMPAC exercise, said the goal to discourage bad behavior in the South China Sea was always weighed against the dangers of letting the People’s Liberation Army Navy (PLAN) see American naval platforms, tactics and capabilities up close. “RIMPAC has a big cost associated with it because of the potential for intelligence gathering,” said Clark, now a senior fellow at the Center for Strategic and Budgetary Assessment. When China participated in its first RIMPAC in 2014, the PLAN sent four invited ships and one uninvited spy ship, as reported by USNI News. 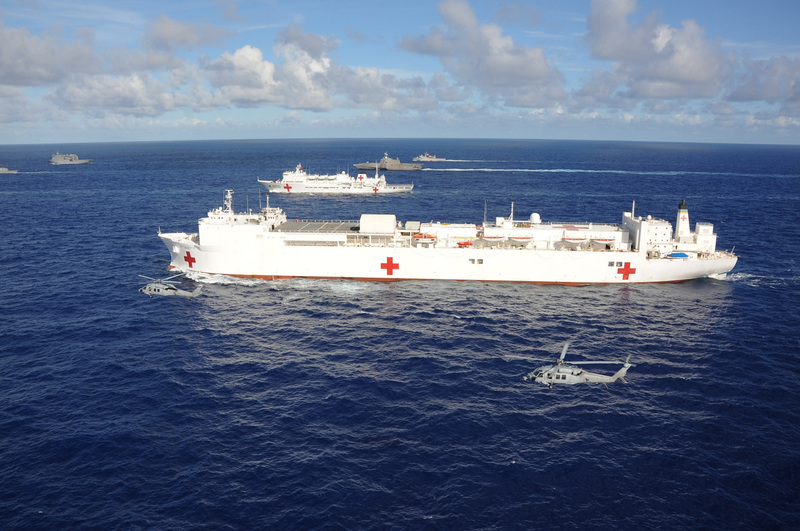 RIMPAC, sponsored by U.S. Pacific Fleet, was first held in 1971 and has since grown to include more than two dozen nations, according to the Navy. Clark said offering Chinese naval leaders a peek behind the curtain of U.S. high-end naval operations only seemed to encourage them to redouble their efforts to improve their own naval capabilities and to build artificial islands to host missiles, radars and other military gear. “They’re developing their high-end capabilities, so there’s no deterrent, and their behavior has not changed,” Clark said. Earlier this week, USNI News reported China’s not-yet-named first domestically built aircraft carrier returned from sea trials. The design for the Type-001A carrier is based on the Soviet-era Admiral Kuznetsov-class, but Clark said most analysts are confident the next carrier China builds will include systems for steam catapult launching and arrested landing. “They’re developing a new clean-sheet design, somewhere between the Kuznetsov and Nimitz class,” Clark said. The future Chinese aircraft carrier will likely be able to launch larger aircraft than PLAN’s current carriers can, Clark said. China is believed to be developing a type of airborne early warning and control aircraft for carrier operations. Meanwhile, China has continued constructing what appear to be military bases on artificial islands. These “islands” are low-tide elevations land formations that are not recognized by the U.N. Law of the Sea Convention as commanding a territorial sea because they are underwater during high-tides. China has been a signatory to the UNLoS treaty for more than two decades, according to the U.N., though the U.S. has never signed the treaty. Periodically, the U.S. Navy has sent warships near these disputed islands to conduct freedom of navigation operations. A recent FONOP mission occurred in March, when USNI News reported USS Mustin (DDG-89) sailed within 12 nautical miles of Mischief Reef, an artificial island in the Spratly Island chain with an airfield now constructed there. In January, USNI News learned USS Hopper (DDG-70) conducted a similar mission past Scarborough Shoal near the Philippines. “The United States has hyped up the so-called ‘militarization’ of the South China Sea by ignoring the facts, and used it as an excuse to cancel the invitation for China to participate in the Rim of the Pacific (RIMPAC) – 2018 multinational naval exercise. The US’ decision is not constructive. Closing the door of communication at any time will not help enhance mutual trust and cooperation between the two militaries,” Senior Colonel Ren Guoqiang, a Chinese military spokesman, said in an English-translation of a statement issued by China’s Ministry of National Defense on Thursday. According to the Pentagon, the PLAN finds itself on the outside of the RIMPAC 2018 exercise because of its island-building efforts in the South China Sea. “We have strong evidence that China has deployed anti-ship missiles, surface-to-air missile (SAM) systems, and electronic jammers to contested features in the Spratly Islands region of the South China Sea. China’s landing of bomber aircraft at Woody Island has also raised tensions,” Department of Defense spokesman Marine Lt. Col. Christopher Logan said in a statement announcing that China’s invitation had been revoked. In response, the Ministry of National Defense’s statement expressed China’s bedrock belief that their activities in the South China Sea are peaceful and legal according to international law. “China has indisputable sovereignty over the islands and their adjacent waters of the South China Sea. It is the natural right of China as a sovereign state to carry out construction activities and deploy necessary defense facilities on its own territory, which is also a necessary measure to firmly safeguard national sovereignty and security and maintain regional peace and stability. It has nothing to do with ‘militarization’ and the US has no right to make irresponsible remarks on it,” Ren said in the statement. However, Clark doesn’t think the current public snub will involve much more than a few sharply worded statements. China and the U.S. are still likely to conduct lower-level exercises involving navy and coast guard ships from both nations, Clark added. Plus, China only recently started participating in RIMPAC, Clark said, with the first invitation sent in 2012 ahead of the 2014 exercise. “I think it’s not going to be a big imposition to the relationship because they weren’t at RIMPAC for a long time,” Clark said. The following is the complete statement issued by Senior Colonel Ren Guoqiang, spokesman for China’s Ministry of National Defense. No matter whether China is invited to participate in the RIMPAC-2018 exercise or not, it is impossible to shake China’s determination to safeguard its sovereignty and security interests, Senior Colonel Ren Guoqiang, spokesman for China’s Ministry of National Defense, said on Thursday in a written statement responding to the US’ disinviting China from the Rim of the Pacific exercise. Ren Guoqiang said that recently, the United States has hyped up the so-called “militarization” of the South China Sea by ignoring the facts, and used it as an excuse to cancel the invitation for China to participate in the Rim of the Pacific (RIMPAC) – 2018 multinational naval exercise. The US’ decision is not constructive. Closing the door of communication at any time will not help enhance mutual trust and cooperation between the two militaries, Ren added. China has indisputable sovereignty over the islands and their adjacent waters of the South China Sea. It is the natural right of China as a sovereign state to carry out construction activities and deploy necessary defense facilities on its own territory, which is also a necessary measure to firmly safeguard national sovereignty and security and maintain regional peace and stability. It has nothing to do with “militarization” and the US has no right to make irresponsible remarks on it, Ren stressed. No matter whether China is invited to participate in the exercise or not, it is impossible to change China’s will to play a role in maintaining peace and stability in the Asia-Pacific region, and it is unlikely to shake China’s determination to safeguard its sovereignty and security interests, Ren said. To develop a healthy and stable mil-to-mil relationship between China and the US serves the common interests of both sides and requires the joint efforts of both sides to maintain it, Ren said. We hope that the US side can focus on the overall situation, abandon the zero-sum mentality, properly handle differences, and try to make the mil-to-mil relationship a stable factor for China-US relations, Ren concluded.